Worries over the financial health of a major Portuguese lender spooked global markets Thursday, drubbing shares in southern Europe and sending U.S. stocks on an early swoon. Note that the TIP ETF outperformed overall intermediate Treasuries (IEI) and the overall bond market (BND) in the aftermath of a Eurozone banking issue. 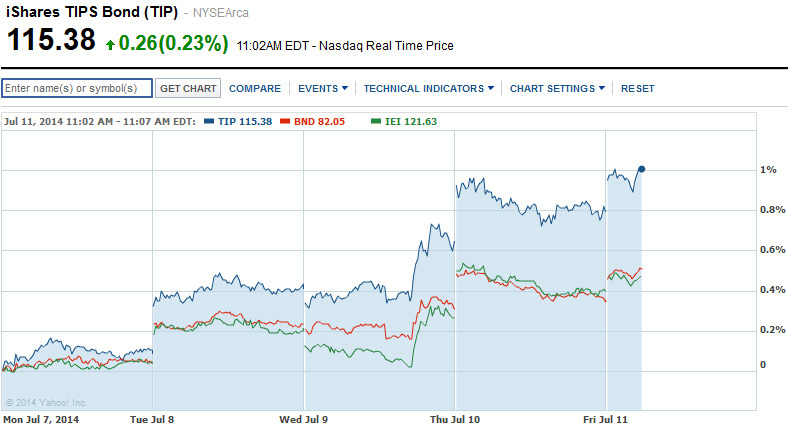 The TIP ETF is up 1% this week (so far), outpacing the overall bond market. When you see TIP outperforming intermediate Treasurys (I’m using the IEI ETF here), you know that TIPS are getting more expensive versus the overall bond market. The nominal 10-year Treasury was yielding 2.58% on July 1 and it closed yesterday at 2.51%, down 7 basis points. The 10-year TIPS was yielding 0.32% on July 1 and it is trading right now at .22%, down 10 basis points. This morning you are looking at a 10-year inflation breakeven point of 2.29%, still in the middle range, but TIPS will be worth watching as reaction to the Euro crisis continues. If investors believe the crisis will force continued monetary easing, TIPS could be seen as more attractive than traditional Treasuries because of their inflation protection. View interactive version of this chart. The trend makes it a tough call for next week’s 10-yr auction, doesn’t it? Mark, the auction is Thursday, July 24. It is a new issue and as of today it would have a yield of about 0.25%, plus inflation. That would be a lower yield than the last six 9- to 10-year TIPS auctions. If this trend continues, it looks like a loser, but that same TIPS will be reopened at auction twice later this year — in September and November.